Shannon Deegan, Director of Global Security Operations at Google, talks about growing up in Montreal, a grandfather who told him “always play to win,” the importance of knowing when to lead and when to follow, and why he loves his job at Google. Shannon Deegan, Director of Global Security Operations at Google, is taking me on a tour of the sprawling Googleplex in Mountain View, California. It’s a sea of primary colors, sculptures, bicycles, cafe umbrellas, and lots of casually dressed young people. Deegan pauses at the front entrance to the three buildings at the heart of the campus. “Did you see the movie The Internship with Vince Vaughn and Owen Wilson?” he asks. “A lot of the movie was filmed right in this area, which is kind of the campus hub,” he tells me. I’d expected a quiet atmosphere with everyone looking at Androids, but no, the restaurant is noisy – with conversation. I find it reassuring to see this kind of person-to-person engagement in a company that is known for putting the world at your fingertips. In The Internship, Vaughn and Wilson are two salesmen left behind in the digital age who find themselves competing with tech-savvy youngsters for a job at Google. But Deegan, 48, has no such worries. Though a lot of the Googlers are in their early 20s, he reminds me that Google was started 16 years ago and the founders, Larry Page and Sergey Brin, are now 41. Deegan then quietly asks how they’re doing “in the process,” and he offers them words of encouragement. He later explains that Google is in-sourcing the security officer team and the two officers he was talking to – like virtually all of the vendor officers – are interviewing for jobs that ultimately roll up through managers on one of Shannon’s teams. The successful candidates will receive a nice bump in benefits to their current situation. As we continue to stroll around campus, some of the Googlers who stop to greet Shannon take the time to put in a good word for their favorites, and after each entreaty he sends a quick text to the recruiting team to follow up. We stop at the Google Earth Virtual Globe exhibition, and Shannon discusses the company’s work with the U.N. High Commissioner for Refugees. By using Google Earth tools Google is able to provide accurate information on refugees and refugee camp counts. We pause outside Charlie’s Cafe, and Shannon talks about the transparency of Google’s operations. The restaurant, named for Google’s first chef Charlie Ayers (former chef of the Grateful Dead), is the largest restaurant in the complex. “It serves hot dogs and hamburgers and tends to be the place people take their kids,” Shannon says, “but on Thursdays, they take away all the tables and leave just rows of chairs. Larry and Sergey get up on stage and talk about new products and they follow that with Q&A for 45 minutes. They do it every week. As large as Charlie’s Cafe is, all of the more than 25,000 employees in this particular Google office couldn’t possibly fit into the space, so big screens are placed strategically throughout the complex. The only reserved seating is for Nooglers – the new hires – who are easily distinguishable by their multicolored beanie caps with propellers, which they wear to their first Larry and Sergey town hall meeting. As we continue our tour, we spot one Noogler holding onto a yellow and green Google bicycle (the employees use these bikes to go between buildings). He seems a bit lost. Shannon pauses, thinking that the Noogler might need help, but he decides that he doesn’t and we move on. Deegan has a soft spot for Nooglers, and recalls how as a youngster he was helped on a life path, that looking back now from the vantage point of Google, has been a “tremendous adventure,” by someone who took the time to point him in the right direction. 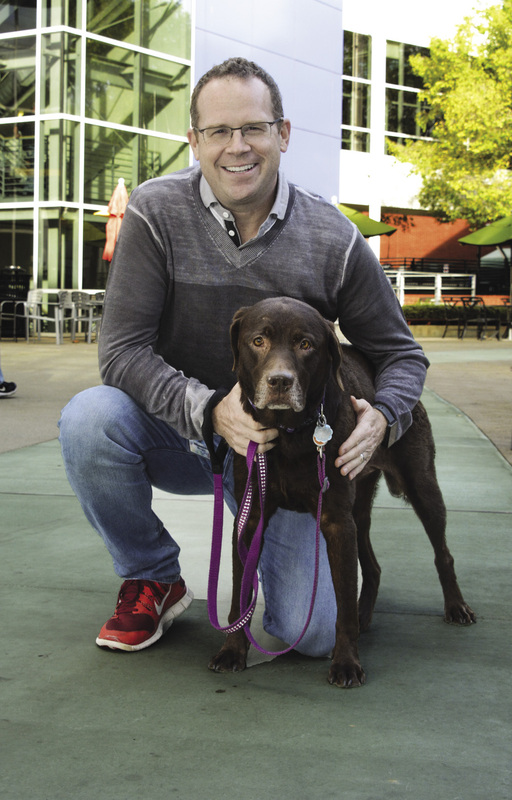 Once touted in the media as “Silicon Valley’s Top Recruiter” Deegan (who for most of his career at Google was director of People Operations) is a former pro hockey player, and he says his experience on sports teams is still a big influence on his approach to work. Growing up in an large extended Irish family in Montreal (his father, with roots in County Clare is one of 9. His mother, one of 7 traces her family to Tyrone) sports was a big part of his life. His grandfather was a professional baseball player – a legend in the early 1900s – and a couple of uncles were Golden Glove boxers with one uncle going on to be a referee of note. But ice hockey is Canada’s premier sport, and Shannon played his first game at three and a half. 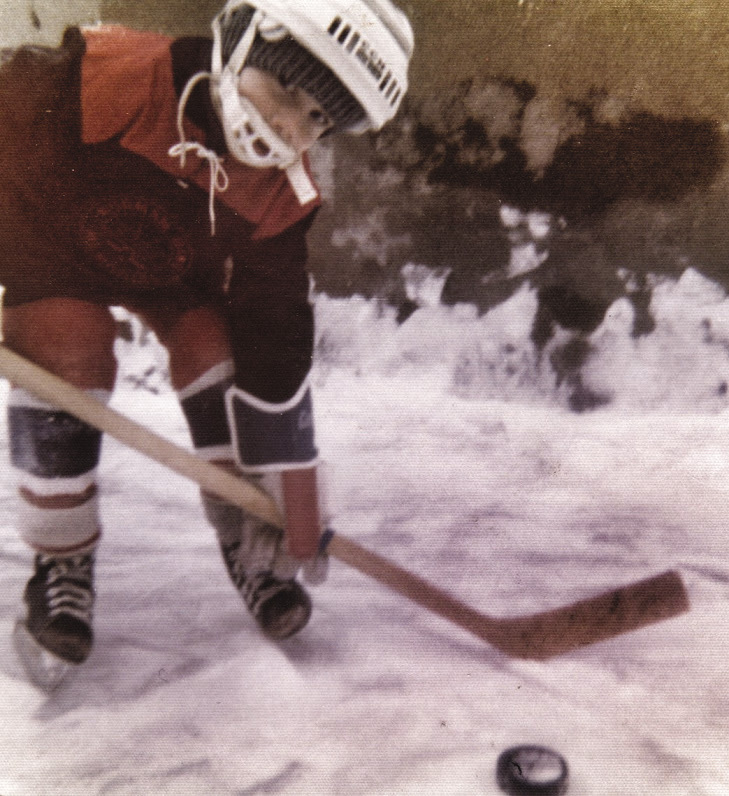 As a 9-year-old, he would often be at the rink at 6 a.m. to practice before school. Shannon’s parents, Katie and Brendan. After his freshman year, Deegan was drafted by the Los Angeles Kings but for the next three years he spurned the team’s offers of a pro contract in order to finish his education. On graduating in 1987 (the youngest student to graduate) he received the Most Outstanding Student Award, and was also named Player of the Year in hockey. Canada’s 1988 Olympic hockey team expressed interest – it was amateur players then – but he decided to turn pro with the LA Kings, signing a significant contract with the Kings after graduation. In his second year with the Kings organization he skated alongside the great Wayne Gretzky before succumbing to injuries that ended his career. Painful though it was, Deegan had academic honors to fall back on and went to work for Canada’s Prime Minister Jean Chretien. After two years in the job, knowing the election was two years away, he took 15 months to do a master’s in International Studies at Trinity College, Dublin. (He remembers “fitting right in,” though he took a ribbing about his name and was nicknamed “Liffey” by his new mates). He returned to work on the campaign where Chretien was elected Prime Minister and spent the next five years on Chretien’s foreign policy team. Then he and his wife, Patti Munce (from the Toronto area, also Irish Canadian – her mother is a Kearns), decided to travel and for the next four years he worked in banking in Malaysia, Tokyo and then Hong Kong. Returning home, in 2000 he went to Yale School of Management and earned an M.B.A., and took a job with McKinsey & Co., a global management consultant company, where he was based in New York and then Toronto. In 2007, Laszlo Bock who had worked at McKinsey before becoming Google’s senior vice president of People Operations, offered him a job. Seven years later, Deegan is clearly at home. He’s happy to be a team player and a team builder at Google, which for five years in a row has been named by Fortune as the number one company to work for. And as for his title, Director of Global Security Operations, he says his job is not that much different from his previous job in HR – it’s still all about finding the right people for the job. Without a doubt the thing I love most about my job is the people. A few years ago I led Google’s central staffing organization and I used to tell my teams that when it comes to hiring, in addition to making sure the person has the necessary skills etc., we should really focus on finding folks who live their lives with passion, who are excited about things, who want to do things, and change things, and be part of things. People who want to engage. I remember our founder Larry Page once saying: “I want to stand in line next to someone at a cafe and when we strike up a conversation I want them to be interesting not just for what their job is at Google, but more importantly, I want them to be interesting for what else they’re passionate about.” I don’t think Larry cared specifically about what a person was passionate about – rock climbing, travel, sports, art, whatever. A recent example – albeit an over-the-top one – was at one of our recent weekly company meetings, Alan Eustace, the leader of a big chunk of our engineering organization, showed videos and talked about his recent skydive from the edge of space, breaking the world altitude record. He mesmerized us all detailing what it was like being strapped to a helium balloon, rising to 130,000 feet and then cutting himself loose with a small explosive to free-fall for four-and-a-half minutes to a top speed of 822 mph. Would you say that playing hockey and being part of a team has influenced your work? Being part of sports teams growing up is a key influence on how I approach my work. The most successful sports teams I was part of were those where the team rallied together toward common goals and everyone understood that each player was equally important to success. It wasn’t – using the hockey example – just about the glamour of scoring a goal, but it was about the sacrifice – in the hockey instance sometimes painfully so – of blocking a shot, or taking a hit to make a play, about doing the little things to stop the other team from scoring, or to help set someone else on your team up for that goal. It’s about knowing when to lead and when to follow, which is a skill the best leaders have. Finally, I think a key element that often gets overlooked in sports and in business, is to have fun. The most successful teams I have been a part of – both in sports and business – have been a blast. While some of that was because it was fun to win, I think it goes the other way as well. Those fun teams I was part of were fun before we ever officially won, and the fun fueled the winning. Shannon’s first ever hockey game aged three and a half. Outside your family, who were your early mentors? I grew up in the tough, working-class Montreal neighborhood of Verdun and went to the local school down the street. The school was run by the Presentation Brothers, and many of them were key mentors for me during high school. Brother Phillip – an incredible wit with a love of Chinese all-you-can-eat buffets that we indulged in together into his nineties – underscored the value of education. My father’s best friend while I was growing up was Father Bob Nagy – who would inevitably make an appearance at our home on Saturday nights to have a Scotch, smoke a cigar with my dad, and watch Hockey Night in Canada on TV– and he helped develop my love of reading, pushing difficult to read books and poetry on me at a young age. Finally, one of the most important two minutes of my life came in the form of a fortuitous meeting with Montreal Canadians superstar goalie, Hall of Famer Ken Dryden. I was ten years old, had cut school, sneaked into a Canadians’ practice and was standing by the players’ bench when he emerged from the locker room. At 6’3” and on skates, Ken Dryden towered above me as he paused on his way to the ice. Looking down, he asked why I wasn’t in school. Not satisfied with my weak reply, he went on to ask where I played hockey and how I was actually doing in school. Apparently a little more satisfied with those two answers, he then advised, “Get back to school, work hard in both school and hockey and go get yourself a U.S. scholarship.” My family, friends and I had never really heard of scholarships but I decided then and there that if Ken Dryden thought it was the way to go, then that was what I was going to do. Six years after talking with him, I accepted a full athletic scholarship to the University of Vermont. Years later at a dinner in New York, I came face to face again with Mr. Dryden, who some twenty years earlier, had set me on the path of a tremendous life adventure. There’s a good chance I never would have gotten an education without having had that conversation. I probably would have quit school at some point in my teens to focus solely on hockey. In just two minutes, he essentially introduced me to a world that I did not know existed. When we met in New York I told him the story and thanked him for changing my life. It was an emotional moment. Can you tell me about visiting your grandfather in the Point? 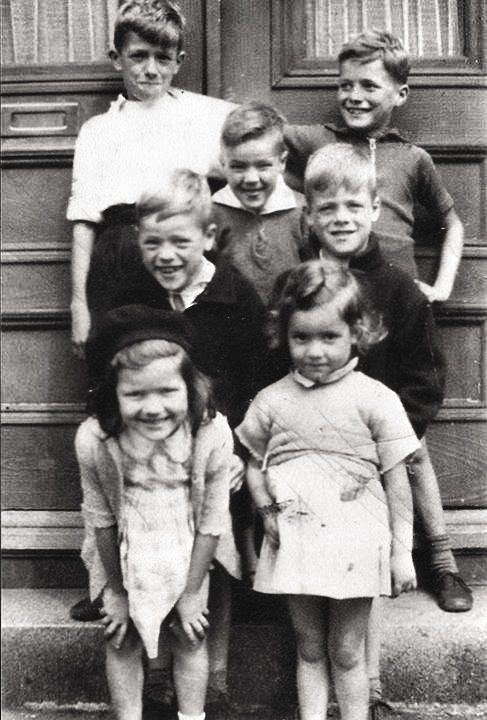 Some of the Deegan kids,1941. My father’s father lived in the same small two bedroom flat my father and his nine brothers and sisters were born in. My parents, brother and I regularly went to visit him – usually after Sunday mass – and I was always dumbfounded how that huge family could have made do in that tiny place, apparently with all the boys sharing a single bed, as my dad would inevitably point out in his effort to out-poor Frank McCourt. I would walk slowly around the dark flat studying the faces of family members in the old black and white photographs my grandfather had taped to the walls. I’d ask questions and learned to associate anecdotes with each person and photo as I grew. It felt like I was looking down through the years, and I could feel a clear connection to both who I was as a result of that family and toward who I was going to be. 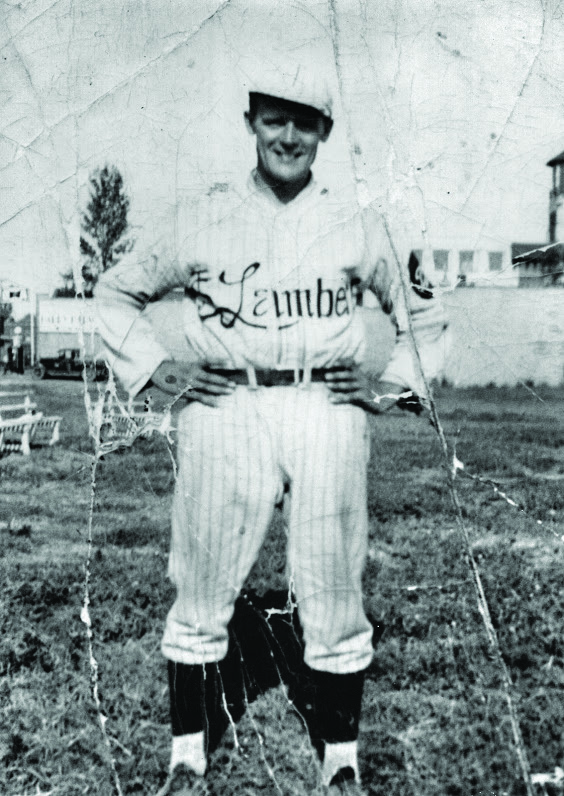 Shannon’s paternal grandfather, the baseball legend Frank ”Lefty” Deegan, circa 1930. Often times when visiting my grandfather, he would either be across the street at the halfway house for convicts just out of prison where he seemed to work – although doing what I never figured out – or next door at the Capri Tavern where he’d meet friends and watch sports. He was a tough old man who didn’t say much and had his share of problems, but in his quiet, gruff way made me understand he was proud I was following in his sports steps. Occasionally he would take a sip of his pint and dispense a quick word of advice. He was a notorious bad sport back in his day, and the stories of pitcher Lefty Deegan brawling after losing a game were the stuff of legend. When I would ask about those times he’d smile wryly and say, “Show me a good loser and I’ll show you a loser,” and we would chuckle together quietly at the political incorrectness of his philosophy. Shannon’s maternal grandfather Fire Chief Joe Timmons. The Point symbolizes to me that connection to roots, to family, to our Irish heritage. It’s not always about where you’re going, but also about where you’re coming from, and I guess that was the connection for Patti and me when we decided to get married at St. Gabriel’s in the Point. Here we were looking to build our future and a family together, and to do that across the street from the place where my father was born and raised, a couple of blocks from my mom’s childhood home, in the church where my parents met and married, underscored the importance of family and history. It’s important to know your history, to know where you’re coming from, and as our children grow, my wife and I are endeavoring to make sure they understand and appreciate that as well. Each summer we spend time in Montreal, always visiting the Point, and we also attend the annual Kearns family reunion at the childhood farm of my mother-in-law, outside of London, Ontario. We tell our children stories of our youth, and our parents do the same. We talk of hilarious aunts, tough uncles, and fun cousins, and of their seemingly endless variety of sometimes crazy, often comical and occasionally heartbreaking experiences. We get together with our large extended families so our children will understand the breadth and history of their families and their place in them. We want them connected to all of that. Did you feel connected to your Irish heritage growing up? I’ve always felt – and continue to feel – a strong and ever-present connection to my Irish heritage. Growing up it was all around me. Weekly it was Sunday mass followed by crowding into the kitchen with relatives and friends, eating a huge breakfast, laughing, and storytelling while Irish music played in the background. I’d feel the connection on the way to my grandparents, driving by the huge stone next to the Victoria Bridge in the Point that was erected by the bridge builders who discovered a mass grave where victims of the typhus epidemic of 1847 had been quarantined in fever sheds, often as they disembarked from the coffin ships from Ireland. The workers, many of whom were Irish, erected the stone in 1859 to commemorate the thousands who died. 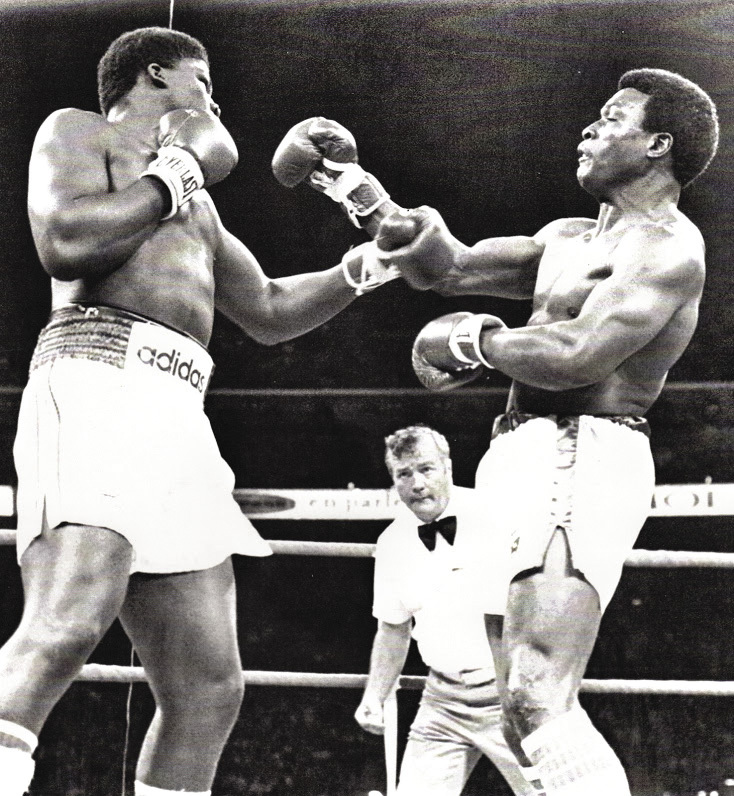 Shannon’s uncle and godfather, referee Freddie Deegan peaks up at Trevor Burbick and John Tate at the Olympic Stadium in June 1980 as one of the undercard fights before the famous Durán-Leonard “No Mas” fight. Burbick was WBC Heavyweight champion but lost the title to 20-year-old Mike Tyson. My extended family were, and often still are, members of the Montreal Irish Society, the Harp and Thistle, the Knights, the Erin Club, and the AOH. While I was seemingly always accompanying my folks to meetings – and wakes – in legion halls and church basements, the crowning engagement for the community each year was Montreal’s St. Patrick’s Day Parade, which to this day is one of the largest St. Patrick’s Day parades in the world. Some of my happiest memories of childhood are of walking in the parade, top hats stuffed with shamrocks, clutching shillelaghs, a solid St. Catherine Street breeze nudging us along as we waved to the hundreds of thousands of fellow Montrealers – most claiming Irish heritage for that one day – who came out to celebrate our culture with us. Some years the weather was perfect and parade watchers wore T-shirts celebrating the early onslaught of spring, which was usually followed days later by April snow. Most years, we battled cold weather and some, the ones we talk most fondly of, were the years we soldiered on through blizzards. I was also connected to my Irish heritage through my father as we loved reading books about Ireland – Trinity, Dubliners, Princes of Ireland, for example, and anything by Brendan Behan – and while growing up neither of us had ever been there, we held out, correctly, that one day we would explore the country together. And I think my appreciation of the Irishness of my childhood experience was magnified when I had the opportunity to do some post-graduate study in Dublin. Visiting with the families of my classmates on a Sunday morning for a fry up, listening to the ebb and flow of conversations around me at Bewleys on Grafton Street, the sing song teasing of the old vendor ladies at the Moore Street market, and to the din of storytelling in the endless pubs, it struck me how similar my life and family experience in Montreal was to that of a Dubliner. I have never felt so at home in terms of my childhood experience anywhere in the world as I do in Ireland. Some people would be reluctant to take on a career change as you did when you joined Google. Is it your nature to be adventurous? I’ve been fortunate to have a life filled with some interesting adventures thus far. I’ve traveled the world, lived in seven countries, and have met so many wonderful, interesting people along the way. My best friend – my wife Patti – and I have done most of that together and we’ve kind of taken the approach that we’re up for anything, including following up having twins with another baby two years later! We moved to Malaysia from Ottawa on a pretty quick whim in the mid-1990s and it was an awesome experience. We followed that with time in Tokyo, Hong Kong, New York, Toronto and now Silicon Valley. To me, home is wherever Patti is and career-wise, I’ve never really had a path that I wanted to follow. I just want to do interesting, challenging things with fun, cool people, and have just taken the approach of being open to new opportunities as they emerge vs. saying, “This is what I want to do next and then I’ll do this,” etc. I think if I look back at the path I’ve taken I can talk as if it all is connected in a logical way career-wise, but that’s always easier to do in hindsight. I certainly have no idea what’s next and have learned not to worry about that and just enjoy the ride. And Google is a pretty special vantage point from which to enjoy it. There is so much online about how to ace the Google interview, does that make it harder or easier for you? I actually think that it enhances our interviewing experience. If a person has spent the time reading all of the online stuff about acing the Google interview, first of all that says they want the job and have prepared for our conversation. Indeed, a question I often ask in interviews is “How did you prepare for this interview?” Being prepared says a lot about a person. Secondly, my questions aren’t going to be of the cookie-cutter-management-consultant “How many ping pong balls can you fit in a swimming pool? I’m going to ask a candidate to describe the hairiest, most challenging problem they’ve had to overcome at work and how they did so. Their answer helps me understand what they think is challenging and I can also subsequently probe how they structured the problem, the analysis they used to solve the problem, how they collaborated with others, and how they overcame obstacles. The conversation can also help me understand how the candidate measures success, etc. So I don’t mind if someone knows the question is coming, as we’re going to have a conversation that will go off in different directions. I’m not there to simply ask a question, listen to the candidates reply in full, and then go on to my next question. The best interviews are conversations, where both people learn about the other. We’ve done research that shows that three interviews with different people is the optimal amount to allow for a thoughtful decision on a candidate. Adding a fourth does not significantly impact the decision enough to warrant the additional time and commitment. Yet we also determined that a candidate needs four interviews to fully get their head around us and to know whether we, and the role, are a fit for them. Hence, we conduct four interviews. Finally, when I interview someone, I’m not only testing to see if they have the relevant experience and smarts to do the job, but more importantly, I’m trying to get to know the person, to understand what makes them tick, and, as noted earlier, if they demonstrate passion and if so, what they’re passionate about. If a candidate knows going into the interview that that’s what I’m hoping to get out of our conversation, then hopefully we’ll be able to delve deeper than if they’re scrambling in their head to find relevant answers. Advice for hiring in startups? Hire smart, passionate people as they will help drive an organization and, particularly in a startup, that’s vital. Folks with a jack-of-all-trades willingness to get done what needs to get done, regardless of their specific role, are imperative. Folks who see a problem and rather than just call it out, roll up their sleeves and fix it. Find folks who love learning new things, are excited to drink from a fire hose of issues coming at them, and who embrace the ambiguity of a startup environment. And finally, and critically, hire people who are nice. Ask the receptionist how the candidate behaved with them while they waited. That tells you a lot about a person. You know they’re going to be on their best behavior with you in the interview, but how were they when they were interacting with others they didn’t feel were part of the process? And make sure throughout the interview you’re mentally conducting what I call the airport test. Constantly be asking yourself, “If I’m snowed in at the airport for eight hours with this person, would it be fun, or would I want to run away screaming?” These are people you’re going to spend more awake time with than anyone else in your life, make sure they’re people you really like. Maybe it’s the stereotypical Canadian in me, but I really believe being nice goes a long way, and over the long run, the smart, nice person who works hard is probably going to be a better employee than the brilliant jerk. Can you talk about the Google culture and the relationship between work and home life? One of the things I love most about working at Google is how we embrace the idea of people being their true self. We’ve successfully created an environment where who you are at home in your non-work life is someone we want to see at work. Again, we think we do a good job of hiring smart, self-motivated, interesting people and we want those interesting things to be seen at Google. Getting to that culture requires a lot of trust on both sides. The employee needs to feel that they can truly express themselves in an open, transparent, and respectful environment. Company leaders need to trust employees to embrace that freedom, to appreciate it, and to carve out their own work style to be the most innovative and productive. This manifests itself in a myriad of ways. It can be as simple as being okay with someone who’s not a morning person showing up to start work mid-morning. Or someone else taking an hour or two each day to take a class, or go for a run, or hit the gym, or take a good walk with the dog they also bring to work. The point is that as a manager, I trust that you’re going to get your work done – and we’ll work together to determine what that is – and I’m not going to micromanage how you structure your life to get it done. Really, give people freedom and they will absolutely amaze you. I explained that given the World Cup games started at 6AM and ran until about 2PM, we had put large screen TV’s in the lounges on each floor so folks could watch. My guests were shocked, admitting that they had put up firewalls on their internal systems so folks couldn’t even watch the highlights online lest they not be working. Our attitude was that rather than trying to clamp down on people’s excitement for the tournament, we would embrace it and make it easy for them to watch. We reasoned that folks would appreciate the gesture and thus would personally ensure that their work wouldn’t suffer. So folks would watch a game or two, or three, often with their laptops open to do emails. When the games for the day were over, I think folks went back to their desks and worked even harder for Google. They were happy and thus able to be even more productive and innovative. There seems to be a trend for kids skipping college and teaching themselves. Is that something you’ve noticed? When I see a candidate who didn’t go the traditional school route I am particularly interested, as I am with any candidate, in understanding the path they’ve taken thus far and the reasons for the decisions they have made. If they have experiences that demonstrate the cognitive ability and skill set required for a role I’m hiring for, and the explanation of their path makes sense and speaks to their passion, leadership, and intelligence, then I’d be delighted to have them on the team. Continuing on this for a moment, at Google I think we pride ourselves on our analytical approach to understanding our business, and our people. We’ve done a fair amount of research into understanding our most successful people at Google and some of that research suggests that things like GPA and name brand school are not necessarily great proxies for success at Google. When you think about someone’s general cognitive ability to be successful in our environment, it’s about their ability to learn on the fly and to pull together various and often dissimilar bits of information to solve problems. All this said, though, for me personally, the academic path was absolutely instrumental to my ability to be successful professionally and in an environment like Google. To start, my liberal arts education opened up a whole world to me and taught me how to think across a broad range of subjects. My business degree to a large extent taught me not only key tools to help me be more analytical in problem solving, but it also helped me understand how to structure my approach to problem solving. An amazing thing about working at Google is the truly game changing area in which we’re diving. Google’s original mission – “to organize the world’s information and make it universally accessible and useful” ­– is both crystal clear and audacious, and when I joined more than seven years ago, it was pretty evident how each new area of business – via either internal development or through acquisition – linked to that mission statement. The development of Android software to move into the mobile phone space, for example, was an effort to extend the accessibility of information. But as we’ve progressed through the years, it’s not always immediately clear how it links back and I always enjoy the challenge of understanding how it all fits. One cool project we’re working on is the development of a smart contact lens that’s exploring the possibility of measuring glucose levels in tears using a tiny wireless chip. The lens could monitor and then warn people like my late grandfather, who suffered from diabetes for years to the point of having to have both of his legs amputated, of concerning changes in glucose levels. Our emerging effort to design tiny magnetic particles – called nanoparticles – that, from what I can understand, could ride through the body patrolling for signs of cancer and other diseases, is fascinating. The possibility of this kind of technology is still being explored, but imagine these nanoparticles could attach themselves to red blood cells, proteins or other molecules and – via a wearable monitoring device with a magnet to attract and count the particles – we could have an early warning system for cancer and other diseases. My colleague Andy Conrad’s dream is for technology like this to usher in a new era of preventative medicine. Another area I’ve been following closely is with regard to Internet access, as I really believe in our efforts to help the Internet reach its maximum potential to make people’s lives better. That’s why we’ve always invested in projects that help the Internet grow, from Chrome to Google Fiber, and why we continue to develop new technologies that have the potential to bring hundreds of millions more people online in the coming years. For example, Project Loon is a system of balloons, carried by winds in the stratosphere, that can beam Internet access to rural, remote and underserved areas down on earth below at speeds similar to today’s 3G networks or faster. The world needs more people trying new approaches to Internet access – two out of three people on the planet are still not online. Most people think current approaches will get us there, but they’re not. That’s why we thought Loon was worth a shot. And another project that I find particularly interesting – as do most people I talk to about Google – is the self-driving car. We believe a fully autonomous operating car could significantly reduce road injuries and deaths. Over 1.2 million people are killed in traffic accidents worldwide every year; in the US alone, it’s like a 737 crashing every weekday all year long. What does the security aspect of your job entail? Our approach to security is multifaceted and covers a breadth of areas of responsibility. The most public facing and easiest to talk about is the physical security of our offices and employees around the world. This would include, among other things, being involved in the designs of our spaces around the world, the security systems we implement and the people at each location responsible for ensuring the safety and security of the space and people. There’s also a big chunk of the role that pulls in my previous life in foreign policy in the Canadian government as we’re constantly evaluating ongoing situations around the world and their possible impact on Google. As you can imagine, Google has a pretty significant global presence that requires us to really think through the appropriate approach we’ll take to a given situation. The Business 100 recognizes the phenomenal success of the Irish in corporate America. The executives, managers, partners, and directors profiles in the following pages represent some of the most innovative and impactful organizations doing business in the United States. From startups to well-established American entities, these companies are as integral to the economy as our honorees are to their shareholders. Those we recognize here are bound by their esteem for their heritage, whether born in Ireland themselves or maintaining close emotional ties through a more distant ancestor, they are a testament to the ever-expanding scope, power, and accomplishment of the Irish diaspora. Irish America is honored to salute this incredible group of entrepreneurs, leaders, and innovators. View the complete list here, and read Patricia Harty’s interview with the 2014 Business 100 Keynote Speaker Shannon Deegan, director of Global Security Operations at Google. Google was following me. Or so it seemed. Immediately after my visit to the Google complex in Mountain View, California, I drove on to Big Sur and the Monterey Peninsula. I confess to being a bit jaded at this stage in my life, and I wasn’t particularly looking forward to spending a couple of nights in a cabin in the woods with my sister and my roommate from the early 80s. But it turned out great. But back to Google. Of course, our cabin had been booked by Googling “Big Sur,” as were our tickets to Hearst Castle, and our hotel in Monterey, which we booked online from the road. It seemed that everywhere we went, Google accompanied us. In the Big Sur Lodge, I glanced at the local paper and the front-page photograph was of a park ranger with his Google trekking camera on his back. (Google’s technology has now made it possible for you to virtually visit a host of national parks without leaving your home), and as we drove back up the coast to San Francisco, a driverless Google street mapping car drove in the lane beside us, and eventually passed us. Google is in our lives, and I for one am grateful. I remember when I first heard the term Google. It was my magazine designer at the time who told me of this great new search engine. It changed the way we operate at Irish America. Google Docs and Gchat mean that we can work from anywhere (except the cabins in Big Sur), and Google Calendar is genius. Then there’s the fun stuff like Google Earth, the virtual globe that allows me to find my home in Ireland and see that the gate is painted (good man, Mike). It’s weird and wonderful. Several years ago my friend Dolores called me from Ireland. “Patricia are you sitting down?” she asked before relaying the awful news. “Patricia, your age is up on the Internet.” Her daughter had Googled me and all was revealed. It hurt, but it also cuts down on fibbing, and motivates me to put on lipstick before leaving the house because you never know where that photo is going to end up! I came away from my conversation with Shannon hopeful for the future, and convinced that Google is a force for good. Not just for the amazing products in development, and the money the company gives to fund scholarships for students, workshops for veterans, and programs to encourage more women in science. All the information Google is making available to us helps us see more clearly where we are in terms of our human evolution, and where we are going. And while it’s amusing to know that the most Googled recipes for Thanksgiving were Pig Pickin Cake in North Carolina and stuffed artichokes in New York, Google can predict a flu epidemic faster than the Center for Disease Control. It can, through satellite photos in the Google Earth project, monitor a natural disaster like the tsunami in Japan, and by showing before-and-after photos, where rescue workers need to be. It can predict weather patterns and help us find ways to save water and save the earth – this sweet spot on which we live. Winners of this year’s Presidential Distinguished Service Awards for the Irish abroad included actress Fionnula Flanagan, humanitarian Dr. Kevin Cahill, and activist and founding publisher of Irish America magazine, Niall O’Dowd. 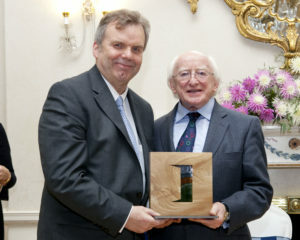 “Recognition from Ireland for the Irish abroad is always very special. 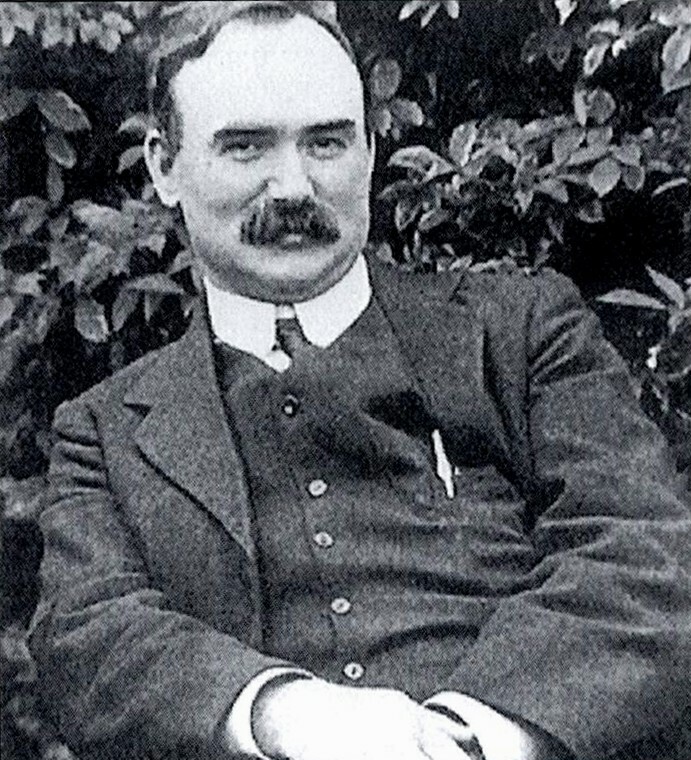 I feel I am in very distinguished company,” O’Dowd, who was honored for his work on the Northern Ireland peace process, said upon receiving the news. The awards, presented in October, included a diverse array of talented men and women from places as far away as Australia and Russia to the U.S. and England. Geologists from Trinity College Dublin have rewritten evolutionary history by finding that oxygen-producing life forms were present on Earth some three billion years ago – 60 million years earlier than previously thought. Working with colleagues from the Presidency University in Kolkata, India, the geologists found evidence for chemical weathering of rocks leading to soil formation that occurred in the presence of O2. Using the naturally occurring uranium-lead isotope decay system, which is used for age determinations on geological time-scales, the scientists deduced that these events took place at least 3.02 billion years ago. The ancient soil (or paleosol) came from the Singhbhum Craton of Odisha (pictured above), and was named the ‘Keonjhar Paleosol’ after the nearest local town. The spirited “Irish 66ers” recently completed their 7th motorcycle journey on Route 66 in an effort to raise money for the Temple Street Children’s Hospital in Dublin. They were escorted by the Los Angeles police Emerald Society for the last leg of the famous highway to Santa Monica Pier where Councilman Kevin McKeown spoke to the exultant crowd. “Your commitment and dedication are inspiring, and I’m happy to welcome you to Santa Monica, where you’ve earned some party time to celebrate your accomplishment,” he said. The Temple Street Children’s Hospital is one of the leading pediatric hospitals in Ireland and treats over 145,000 Irish youths a year. Irish-American scientist John O’Keefe was awarded the 2014 Nobel Prize in Physiology or Medicine, sharing the award with Norwegian husband-and-wife researchers May Britt-Moser and Edward Moser. O’Keefe’s groundbreaking work on the brain has opened up a new way of viewing how the mind works. He discovered a positioning system of the brain or an “inner GPS” that makes it possible to map out our brains. Thanks to O’Keefe’s breakthrough, more research and breakthrough’s of brain diseases such as Alzheimer’s is now possible. 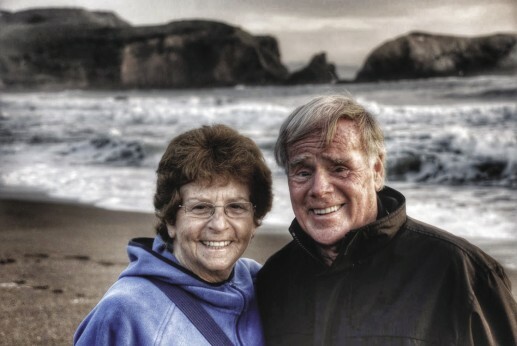 O’Keefe was born in 1939 in New York to Irish immigrants from Co. Cork. He is currently a professor at the Institute of Cognitive Neuroscience and the Department of Anatomy at University College London. Later this year he is set to receive an honorary doctorate from University College Cork. The O’Keefe name seems to be a popular one in the science field. The late NASA scientist John O’Keefe was credited with the discovery of the earths “pear shape” after studying satellite data from the 1950s. Their work is a clear sign that Irish ingenuity continues to resonate all around the world and even in space. – M.S. 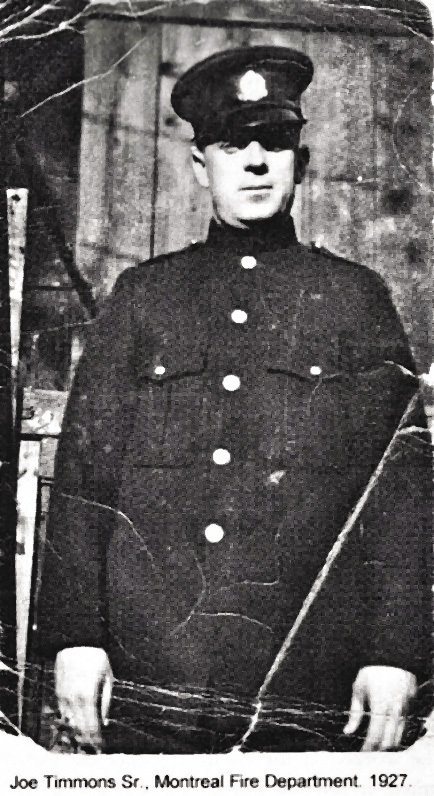 McCann also refers to MacDiarmada’s final words written right before his execution: “I feel happiness the likes of which I have never experienced. To see more on The Rising, visit therising.ie or email Kevin McCann at kevin@maccana.ie. While rain is free and plentiful and free in Ireland, it appears water is not. Public outrage is sweeping across Ireland over the introduction of mandatory water meters that would raise the cost of living for many in the country. With the introduction of the water meters, Ireland will be paying some of the highest rates for water in Europe. Previously, water came out of the taxes of the Irish people, but a stipulation in the 2010 EU bailout of Ireland now requires water meters for its citizens, raising the annual charge of water to 278 euro. Many of the protests are centered not so much on the introduction of the meters themselves, but the poor levels of drinking water throughout Ireland. The country’s Environmental Protection Agency routinely fails more than 14% of Ireland’s drinking levels, finding parasitic bacteria that may be harmful to people. In many places, residents have taken to purchasing large amounts of bottled water. For now, peaceful protests continue to be waged across the island as dissatisfaction and anger continue to boil over.